Free camping on the beach…now that should raise an eyebrow. 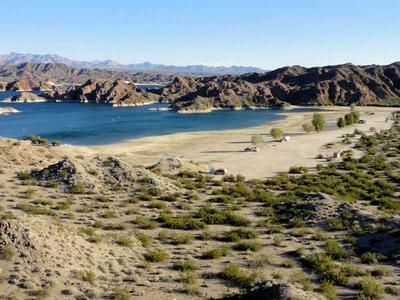 The Nevada Telephone Cove camping area lies on the shore of Lake Mohave north of Laughlin, Nevada in Lake Mead National Recreation Area. It’s tough to find water in the desert, and even tougher to find RV camping near it. Sit back and enjoy the sounds of birds, the lulling of gentle waves hitting the beach, and the refreshing breeze that rustles the cottonwood leaves. This truly is an oasis in the desert. Camping doesn’t get much better than this. Campground Directions: From the Colorado River in Laughlin, Nevada head west on Highway 163 (Laughlin Hwy) for 4.4 miles. Turn right (northeast) on Nevada Telephone Cove Road and drive 4.3 miles to Lake Mohave and the Nevada Telephone Cove camping area. This is a large cove and I suppose 15 or more RVs could easily camp here…though it may feel a bit crowded with that many RVs. More Camping: Unfortunately there is no other camping along Nevada Telephone Cove Road – but I did hear from an NPS ranger that there were a few places to camp down Road 14 (Stonehouse Road) south of here, as long as you’ve got a small 4WD RV, as this is a primitive road and you will encounter soft sand. Even if it’s not the prettiest beach: it has more gravel than sand, and turns to mud near the water (due to low lake levels) – it’s still a wonderful place to camp. It’s easy to avoid the mud by walking around the cove to the rocky shoreline. Here you can access the water without getting ankle deep in mud. Lake levels are way down and that’s why it’s so muddy near the shore. Recreation: Exploring the coastline is fun, and so is exploring the canyons along the coast. Swimming is also fun, though you do have to wade through a bit of mud to reach deeper water. The temperature of the water felt a bit cold at first, but it's nice when air temps are in the 80s and above. The nearby canyons (Grapevine Canyon, and the one north of this cove) are fun to explore. There are several waterfalls (dry unless there's a rain) that are neat and require a bit of climbing (class 3 perhaps). Facilities and Rules: A sign at the entrance to the cove states the camping limit is 7 days. No trash service is available so you must take your garbage with you. There are trash bag dispensers here, making it easy for campers to haul out their trash. This camping area has non-flush restrooms that are maintained daily. No boat ramp was visible, but from the signs it appears one used to exist. Driving to the shore is not possible due to the mud. Only boats light enough to carry can be launched here. Wildlife: The water is quite clear and I’ve seen several large fish (probably carp). There are lots of waterfowl here too: great blue herons, great egrets, many American coots, and gulls. I’ve also seen gambel’s quail, great-tailed grackles, bats, small lizards, raccoon tracks along the shore, squirrels, and rabbits. East of Bullhead City I spotted a herd of bighorn sheep among the mountains. Insects: Some flies and a few mosquitoes, but no problems. Weather: I was camped up above along the road and overlooking the city of Laughlin, but was told no camping was allowed here by the NPS ranger. It was a few degrees cooler up there. It’s been warm here. Highs have been in the mid to high 80s, possibly 90 on the last two days. It’s not as cool at night here either, probably a low around 60. The last couple days have been quite windy, but today it was much calmer with only a slight breeze. This is my 6th day here and I haven’t seen a cloud yet. Cell Signal: I have a very good Verizon cell phone signal, usually 3 bars. Verizon mobile broadband internet is fairly fast, it’s Global Access here and watching videos isn’t really possible, but pages load pretty fast. Peacefulness: The weekend was fairly busy with around 8 or so different groups camping. There were just 2 other groups camping yesterday, then just one other RV most of today. This afternoon 3 more groups showed up. It’s a well known camping area, though it’s a bit out of the way down a washboard, but well maintained, gravel road. I’ve been seeing 3-5 vehicles a day come by the cove. Shade: There’s a handful of cottonwood trees spaced out along the shore which provide some shade for camping. RV Solar: Plenty of sun here. I have no problem getting a full charge with my solar panel. RV Campsite Rating: 10 out of 10. What can I say? It’s free RV camping on a beach in the southwest. Here’s your oasis in the desert! Any good fishing spot here from the shore? I need to be in the Laughlin area for a few weeks, can you stay for 7 days then leave for a few then come back for another 7? Is it possible to launch a fishing boat? The road is a dirt road which I don't mind when it is level and not steep inclines. This road has down hills I will have to climb coming out and hills to climb going into. Hills are about 75 feet long and steep enough to have concern. Regular 2 wheel drive climbs these hills fine. But will have a 4x4 Desiel with Alison trans max package but pulling a 5th wheel of 38 feet and about 15-18k in weight. Not sure if I will get stuck or slip the tires on the incline. Should I attempt with a running start or use 4H and cruses the hill and not worry about the weight pulling on the truck as the angle of the incline feels like it will just pull me backwards. One 5th wheeler toy hauler about the same size was found in this location and Class A RV both about the same length the 5th wheel looks like it weight lighter as it has no slide outs. If I can get into this place it will be an awesome weekend get away every time. But I don't want it to be a disaster as it will have no place to turn around unless I get to campsites. thinking of heading over to telephone cove for camping and was curious if fires were allowed? HOW BIG CAN YOUR RIG BE? 40FEET FIFTHWEEL AND 4 WHEELDRIVE OK??? HOW GOOD IS ROAD DOWN THERE? ALL GRAVEL?? Yes, it's gravel all the way. Plenty of room, you should have no problem. I remember seeing a few dogs when I was there. As long as they're friendly dogs, you should be fine! I'm going this weekend and plan on bringing my 2 dogs. I hope that's not a problem. If few enough people, I shouldn't have to worry about keeping them on leash. the water was all the way up to the trees. Join in and write your own page! It's easy to do. How? Simply click here to return to Free Nevada RV Campgrounds.